National mourning for President Tran Dai Quang. Speculation is growing that Vietnam’s most powerful leader, Nguyen Phu Trong, is planning to assume the role of president in addition to his current job as general-secretary of the Communist party. 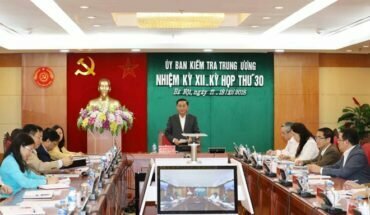 Reports say that the politburo has backed the idea following the death from illness last month of President Tran Dai Quang. 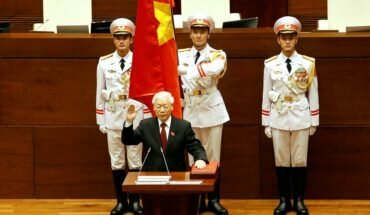 Mr Trong is already first among equals in Vietnam’s four person collective leadership, and critics worry that he could accumulate too much power by combining the roles of president and party boss. The Communist party may be testing the public response by deliberately feeding rumours on social media about the planned move. In the past, the party leadership has opposed the concentration of power in the hands of one man. It has extolled the virtues of collective leadership, with power and responsibility balanced between the general-secretary, state president, prime minister and chairman of the National Assembly. In reality, however, the post of president has become largely ceremonial, and some argue the division of responsibilities creates confusion among foreign leaders and obstructs more direct personal diplomacy. Mr Trong has emerged from the shadows to play a more active role on the international stage in recent years, travelling to both Washington and Russia to hold talks with President Putin and President Obama. Some Vietnamese will see the logic of him increasing his profile still further by formally taking on the role of president. Mr Trong has won a degree of popularity at home with his high profile leadership of an anti-corruption campaign that has seen the arrest of prominent politicians and business leaders. However, civil society activists and other government critics have felt the brunt of increasing repression, as Mr Trong and the ideological conservatives around him consolidate their grip. His position means that he is not subject to scrutiny about his own financial affairs and wields great power over the judiciary and Vietnam’s formidable internal security aparatus. Mr Trong has overseen a harsh crackdown on bloggers and other activists since he was appointed to a second term in office at the party congress in 2016. His growing consolidation of power, intolerance of dissent and focus on anti-corruption has led to inevitable comparisons with Xi Jinping’s trajectory to unchallenged power in China. 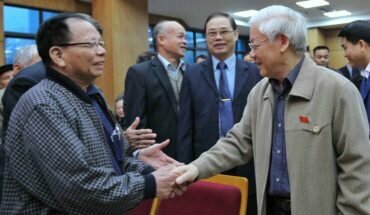 While, some analysts caution the comparison should not be pushed too far, there’s no denying that Mr Trong has dominated the Vietnamese political scene with a new energy and determination since dispatching his rival, the former prime minister, Nguyen Tan Dung, at the 2016 congress. The National Assembly will vote on a new president later this month after recommendations are made by the politburo. Few expect any signs of opposition if Mr Trong decides he does want the presidency. Tran Dai Quang, a former hardline internal security minister, was once seen as a formidable power broker in his own right and had been a potential contender for the role of general-secretary. His untimely death smoothes the way for a consolidation of power at the top that Vietnam has not seen for many decades.